Last spring, I took a class called "Writing with Readers in Mind" with a former Charlotte Observer editor. Our concluding piece for the class could cover any topic we wanted to address in article form. So for my final college paper, literally the last assignment I did at Davidson, what did I write about? It's a tough question, I know. Here (to be presented in several segments), in honor of the impending arrival of Midnight Madness and the 2010-2011 season, is the story. It's not brilliant, and was written around 2 AM the week before graduation, but it's important in its own way. Besides, I'm already getting pumped for those winter nights. Maybe y'all are too. Imagine: It's basketball season at the tiny college in Davidson, North Carolina. You sidle down the cobblestone sidewalks and pass the bronze Wildcat statue, the cold February air steaming when your hot breath hits. You squeeze through traffic-jammed cars and the bus from the nearby assisted living home. You walk into the lobby and breathe in the unusually satisfying mix of smells: buttery popcorn, old carpet, chlorine from the pool next door. The pep band is already warming up, brass blaring through glass, and little kids scurry through the growing crowd to reach their seats in time for tip off. Open the glass doors and suddenly you're enveloped -- the brass is louder, and mingles with sneakers squeaking as the team warms up on the court. The humming of the crowd rises as the pre-game clock ticks down, friends enjoying the calm before the storm of a forty-minute battle. In the section directly behind the basket, students wear red and black t-shirts; some are even skimming books for tomorrow's classes. But in the very front row, a quartet of boys leans far over the rail, hollering encouragement, dressed like they're about to go out trick-or-treating. "One of the outlets in the bubble we have is to go to a basketball game," Phil explains. "You're yelling for a couple of hours," Morgan says. "You get to forget about all of the crap you have to do." "We dance, we have fun, we get hype, y'know, we make it an event," Jeff agrees. "I wanted to be consistent," Wes recalls. "I've been to all the home games when I've been in the States -- I studied abroad sophomore year first semester -- and I was sick one time last year." Like many sports fans, these four wear their hearts on their sleeves -- but theirs are the most noteworthy sleeves in Belk Arena. While Davidson College's official mascot is the Wildcat, the front-row four have earned their own places in Davidson basketball lore. Tonight, the last home game of the season, I bound down to the front row with my camera. "Hey guys! Picture!" With a click of my shutter, they are frozen in time -- young men who deeply love a sport, and more importantly, a school and their team. Phil, wide-eyed and grinning, his tall candy-cane hat slipping back on his head. Wes, face scrunched up in excitement, one boxing glove aimed at the camera. Morgan is squeezed in the middle, a sliver of his freckled face visible beneath his thick white shell. Jeff's head and mouth are covered by black cloth, and his glinting eyes flash one message: Bring it. Phil, Morgan, and Jeff will tell you that it all started with Wes. He wanders out from the library to talk to me, plopping down on the bench as fat gray clouds roll in. Wearing a collared polo and khaki shorts, most folks wouldn't immediately recognize him as "the boxer guy" in the front row of every basketball game. In two weeks, he will graduate from Davidson College. Four years ago, he chose the small liberal arts college over one of its well-known Tobacco Road neighbors. "I grew up a Duke fan, really big Duke fan. Always a big fan of the work the Cameron Crazies do -- but I visited Davidson and felt like it would be a better academic experience." Davidson has one of the smallest Divison I athletics programs in the country, and highly touts the ideal of the true student-athlete, emphasis on student. It wouldn't compare to the rowdiness of Cameron Indoor Stadium, but Wes planned to make his college sports experience worth it. "I told myself, 'I'm gonna come to Davidson, but I'm still gonna get into the basketball and be ridiculous.'" He racks his brain for an original costume idea: "I kind of like the people who just do random things that don't really have a connection, as you might have guessed," he chuckles. The pieces slowly came together. "I like the Rocky movies. I had a pair of boxing gloves, 'cause I boxed a little with my friends in high school." Wes's grandmother lives in Concord, not far from campus; "I knew she could sew some letters on the back of a bathrobe for me." In November 2006, he set out for Belk Arena with plush black boxing gloves covering his fists, draped in a black bathrobe with his name emblazoned on the back. It began a dedicated four-year run during which he had a significant effect on the atmosphere of Davidson basketball, recruiting his friends to join him in the front-row fray. "I did push people in some directions," he says sheepishly. He and Wes went to high school together, a grade apart. "He was a great role model for me," Phil recalls. They played on their high school tennis team, and shared a deep passion for college basketball. As a senior, Phil visited Wes on a game weekend. Wes convinced him to dress up and join him up front. Phil recalls his friend's enthusiasm: "'I got this uniform, I got this boxing outfit! Come on Phil, you gotta have your own thing.' We all decided to paint my body red, and I was in a red Speedo, and that was all I was wearing." When a photographer snapped a picture of the student section that day, Phil was front and center, mouth wide open, pointing to the camera -- "The atmosphere of that game was awesome." He was caught up in the frenzy, hooked, more than six months before he enrolled in the Class of 2011. When basketball season began that fall, Wes urged Phil to come up with a running gig. "You gotta get your own thing!" While on the hunt for Halloween attire, he bought a Cat in the Hat costume. The effect at games was immediate. "A family came up with a little kid: 'Mommy, Mommy, it's the Cat in the Hat!' I was wearing the Aviators, and I felt like such a college kid," he laughs. "After that, it kind of snowballed." That same season, Jeff decided that it was time. just show up to the high school football games with cheer uniforms ... Then senior year of high school football, I actually got a referee costume. I always loved dressing up -- whenever there were spirit days in high school, I was the kid who would go all out." After spending freshman year watching his best friend Wes go nuts in the front row, he knew he needed to join in. "Because that's me ... I love dressing up and being a crazy fan." His friend Zack thought up the idea of a ninja. "Immediately that just blew my mind as an incredible idea, 'cause I love ninjas, everyone loves ninjas, and most people want to be ninjas ... It just worked great for the setting of sport to do it -- and once again, I love ninjas." "My mom is very good at finding things on eBay. She's like an eBay goddess, so I know that when I need things, I can always just email her." 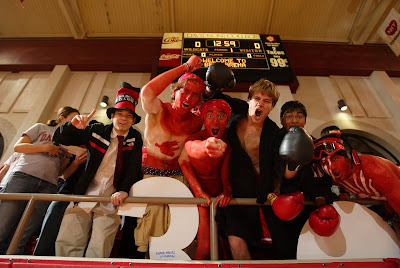 The red and black suit -- indeed, purchased on eBay -- made its debut in November 2007, when Davidson played UNC in their home opener. "We played really well that game even though we lost, but I knew that I had found my Davidson fanhood identity." In March 2008, the Davidson men's basketball team mesmerized the sports world. How often does a school of 1,700, known for producing lawyers, doctors, and non-profit directors, hold the longest winning streak in the nation and come a shot away from the Final Four? For ten days and four NCAA tournament games, the 'Cats were America's team. The college's trustees donated thousands of dollars so students could travel to Detroit for the Sweet Sixteen and Elite Eight games. Phil, Jeff, and Wes rode 22 hours round trip to be in the middle of the thrill. Jeff sighs with memory. "That's probably the greatest place the ninja's ever gone. When we beat Wisconsin, that's easily in the top ten greatest moments of my life ... maybe top five." "It was just such a delight." Phil is still beaming two years later. "Y'know, my team made it to the Elite Eight. This small liberal arts school made it to the Elite Eight my freshman year."